Do you ever wish you could find that one unique showroom featuring a magical collection of one-of-a-kind antiques, statuary, and custom-made outdoor iron furniture? We get it! 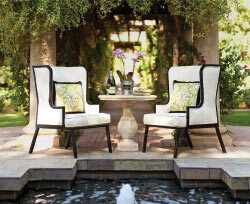 We are here to inspire and help you personalize your outdoor spaces and harness the power of your own imagination. This is what we have loved doing for over 19 years. Helping designers and customers all around the country with creative outdoor solutions. Welcome to On The Veranda!